There's now a photo floating around that allegedly pictures Fake Steve Jobs holding a special edition, leather-bound Lenovo ThinkPad Reserve. Why this matters, I don't know. But the thing is that some people believe is real and we are going to say it's fake: It's fake. There. Fake fake fake. Fake. Come on, it's fake Steve Jobs. As a source? It is fake—not for obvious reasons, like "Steven P. Jobs" being in focus while the surface onto which it has been stamped is not—but because we actually have the real picture. Which shows that the image above has been retouched—intensely— after the jump. Looking at the photo posted by FSJ and other blogs, you don't have to be Gizmodo's local pixel pusher and expert barman to see the Photoshop job. Anyone with two eyes and even more margaritas in their bloodstream than me will be able to see that the name "Steven P. Jobs" is in focus while the rest of the picture, specifically the corner in which it is placed, is not. Somehow, Steve is moving but his name is staying in focus, frozen in space and time. Maybe his RDF is so strong than one of his many powers is that His Name always stays perfectly visible and sharp. But then again, if that's true, we just can't imagine His Steveness holding something as naff as a leather Windows machine with his full name stamped on it. We just can't. Or can we? 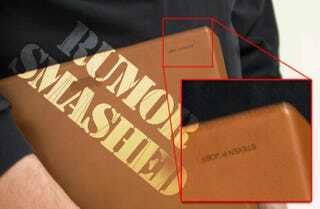 Actually, the truth is that he may have a ThinkPad Reserve, but the photo shown by FSJ has been manipulated to hide the Real Truth! This image proves beyond any doubt that the photo posted by FSJ was obviously doctored. It also proves that 1) Steve is a Monty Python fan (understandably), 2) Steve doesn't use iPods or iTunes, preferring vinyl LPs on his Technics turntable and 3) Steve's admiration for Johnny Cash is pure façade: he is a super-disco man all the way. This last bit is further confirmed by his obsession with shiny surfaces and mirrors. Now we can only hope that Steve gives us more boom, bass lines and some Dancing Queen in the next keynote. Worst. Keynote. Ever. Shirt. Period. So there you go. Another mystery solved by Gizmodo's CSI brigade so you can continue with your lives knowing that we are here, defending Truth and Justice. And tequila cocktails. And wet T-shirt contests. Especially wet T-shirt contests. Or something. Uhm. Carry on, Citizens.